Our Granite Tab business card template represents your brand with confidence and authority, plus just a touch of contemporary styling. 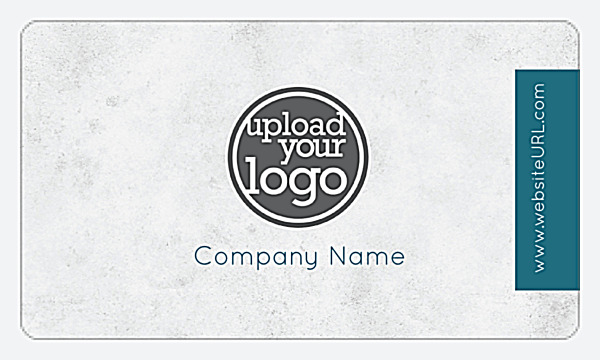 The front features your name, company name, and contact information on a modern solid color block, augmented by line separators and attractive icons – all on a textured granite backdrop. The back displays your logo larger than life on the same granite background, and adds a dash of style with your website URL vertically printed in a side tab. Granite Tab is a perfect business card for any type of business that wants to establish its authority and expertise without losing sight of its cutting-edge processes. Personalize Granite Tab with your choice of three colored schemes and four die-cut shapes, then add your custom logo and any text to print business cards that truly match your brand. 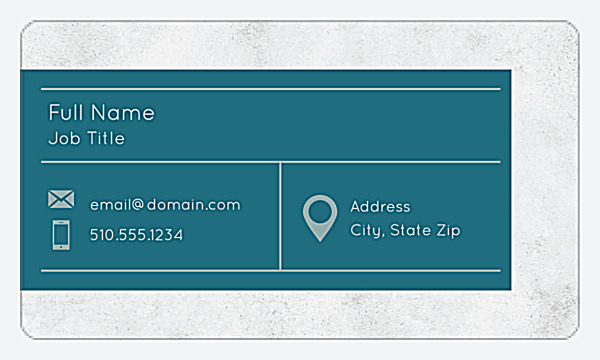 Our online design tool lets you create professional-looking business cards without the need for a professional designer. Save money and time by letting our design tool walk you through the process of business card template selection and customization; then, download a PDF of your finished design before you go to print. Print business cards with affordable pricing and great value when you choose PsPrint. Every job is backed by our customer satisfaction guarantee, and features high-quality paper stocks that look and feel great in your customers’ hands. Whether you’re printing standard business cards or want more flair with ultra business cards – or something in between – PsPrint has everything you need to print beautiful business cards that make a lasting impression on your prospects.